There are 85 designated national monuments in France, places of historical importance that are now looked after by the state for the benefit of all. The national Monuments cover a wide range of buildings and structures, from archaeological sites and prehistoric caves to renaissance castles and buildings housing items relating to important people in France's history (eg the collection related to Marshall Foch). You can see a map showing the national monuments at the bottom of this page. This Mediterranean port town built in the 13th century to protect France is still surrounded by almost two kilometres of ramparts with 20 towers - you can follow the 'rampart walk for the entire distance. One of the most impressive gothic style monuments in France the cathedral at Amiens is also notable for being the biggest. It is the splendid towers that have been listed as a national monument - these can be entered for very good views across the city center. See Amiens Cathedral for details. A very large castle in the center of Angers which combines traditional medieval defences and towers with subsequent interior enhancements in the apartments and gardens to make the castle more comfortable to live in. Angers castle is best known for the 14th century Apocalypse Tapestry - at over 100 metres long it is the largest medieval tapestry in the world. Developed over more than eight centuries, the oldest part of the benedictine Montmajour Abbey is represented by a very ancient (10 th century) structure, a roman style cloisters and an abbey church. The substantial monastery of Saint-Maur was added in the 18th century. Montmajour Abbey is a few kilometres outside Arles. An important example of 16th century renaissance style architecture for the Midi-Pyrenees region, unfortunately a substantial part of the castle is no longer standing although there is enough to get an idea of the original splendour of the castle. Situated in the countryside about 15 kilometres north-west of Figeac. Chateau Azay-le-Rideau is a very lovely example of the early renaissance style of architecture made especially attractive by its scenic setting - it was built on an island in the Indre river. The architect incorporated the latest trends in both Italian and french styles in the design to great effect. See Chateau Azay le Rideau for more information. The 19th century inventiveness of a certain Auguste Verité created this remarkable 'clock' with its 57 faces giving information about everything from tides to movements of the moon and also an 'automata' and requiring more than 30000 moving parts! See more highlights in the town at Besancon. The 15th century gothic style Pey-Berland Tower is next to Bordeaux Cathedral of Saint-André and is the belltower for the cathedral. Interestingly it was built slightly apart from the main cathedral to avoid the risk of vibrations from the bells causing structural damage to the cathedral itself. From the tower there are some of the best views across the city. See Bordeaux for details of this and other monuments. A recommended detour from Valencay to the north-west, Bouges castle is a good example of Louis XV architecture. The furnishings and carefully planned gardens are among the highlights of a visit, and there is also an impressive collection of horse-drawn carriages. The monastery at Bourg-en-Besse is an example of the so-called 'flamboyant gothic' style of architecture built in the early 16th century. Flemish artisans were brought in to create the many ornamental highlights of the church such as the altarpiece, stained-glass windows, tombs and statues. There is also a museum dedicated to the history of the monastery. The Jacques-Coeur Palace: built in the 15th century for a rich financier and considered as one of the most impressive examples of 'non-religious' flamboyant gothic style architecture in France, especially the eastern facade of the palace. Towers of Bourges Cathedral: also in gothic style, the cathedral at Bourges is one of the best examples in France. As well as the cathedral itself the staned glass windows (12th -14th century) are a particular highlight. See Bourges for more information. East of Fontenay Abbey, the castle at Bussy-Rabutin is also in an attractive wooded setting. Particular highlights include the grand apartments in the castle designed by the Count of Bussy who lived in the castle and wrote his 18th century memoirs of the Sun King, Louis XIV of France. The castle at cadillac was built in the early 17th century as a noble reesidence, then used in the first half of the 19th century as a women's prison. You can still see aspects from both of these periods in the castle, providing interest by the dramatic contrast created by the two characteristics. Perhaps the best known and most complete fortified town in the world, the castle and fortifications we see today at Carcassonne largely date in origins from the 13th century, although substantial (and sometimes controversial) renovations were carried in the 19th century by Viollet-le-Duc. You can walk along the ramaprts and walls and there is also an explantory video explaining the 800 year history of Carcassonne. The very important prehistoric stone alignments at Carnac cover a very extensive area (about 100 acres for the main alignments) and frequently follow a carefully laid out plan. The exact reasons for the alignments, created over a period of several thousand years, may still be unclear in many respects but that doesn't diminish their unique appeal and fascination. Half castle, half manor house, Carrouges Castle in Normandy still feels like a family home to visit (if rather larger than most). At the castle you will also see some lovely furnishings and decorations, and enjoy exploring the extensive grounds that surround the property and are now carefully laid out and maintained gardens. The castle at Champs-sur-Marne is a good example of the grand architecture common among landowners in the early 18th century. The style continues both inside the castle with its furniture, panelled walls and paintings and in the surrrounding parkland which is one of the most impressive parks in the region. Note: the castle is closed for renovation until at least 2013 but the park is open as usual). This 16th century castle contains a great deal of decorative highlights. In particular there are a substantial number of 16th century wall murals telling stories from mythology and other subjects. Outside the castle you can see ancient vines that have been collected from the vineyards of Saint-Pourcain and Chareil. The benedictine abbey at Charroux was founded in the 8th century then further expanded until the 15th century. Now one of the most important historical monuments in poitou-Charentesn the abbey is best known for its octagonal tower (called the 'Charlemagne Tower') and other gothic style highlights and decorations. For a very long period (more than 1000 years) the cathedral at Chartres was one of the leading pilgrimage destinations in France. The cathedral suffered important fire damage at several times during its history which explains why one tower is from the 12th century, the nave is 13th century and the other tower is 16th century. Be suer to ascend the Jehan de Beauce tower for a better look at the gothic workmanship and views across the rooftops of the town. See Chartres cathedral for more information. The imposing castle in the Loir valley at Chateaudun has its origins in the period from the 12th to the 16th century, with each period leaving its mark in the architecture which includes both gothic and renaissance style elements. Also at chateaudun you can see an impressive tapestry collection, while the chapel holds some high quality medieval statues. The abbey at cluny was founded 1100 years ago and quickly grew to be the most important spiritual center in France - less well known, it was also the artistic center of France at the time. The main highlights include the belltower and the main nave in the church which is the highest vaulted roof built in the romanesque architectural style (substantially in ruins). See Cluny for detailed information about the town and abbey. Many people have never heard of coucy today but in medieval times it was one of the largest castles ever to be built: the ramparts were two kilometres long and included 33 towers and enclosed an area of more than 30 acres and the main castle keep was the largest in the western world. Because of years of neglect and substantial damage during the First World War it is now the extensive castle ruins that we can see, but these are still more than sufficient to evoke the original castle. Voltaire (1694-1778) is still one of the best known French philosophers and historians so it is no surprise that the castle he built and lived in (from 1758-1778) and where he spent the most productive part of his career is of great interest to visitors. The importance of Voltaire in the enlightenment movement also meant that many of the leading intellectuals of the period spent time at the castle. Fontevraud Abbey, with its origins as a very important monastic center in the 12th century, is one of the most complete medieval abbeys to be seen in France. At its peak it was important enough for the Plantagenet kings to be buried here. Among the main highlights are the dome on the main church - and the very extensive kitchens for the abbey. See Fontevraud Abbey for details. Much more modest than most of the castles listed as French National Monuments, the Chateau of Fougeres-sur-Bievre is noteworthy as an example of a small-scale rural type castle. The castle has all its important features intact including the keep and the defensicve walls, and you can also see a small medieval garden. The cloisters in the cathedral at Frejus are on two levels with arcades and columns at both levels. The most unusual feature is the wooden panelled ceiling work under the ground level arcades which features hundreds of small wooden panels painted with scenes of animals - although only a couple of metres above your head bring binoculars to see the detail of the individual paintings! Also in the cathedral you can see a rare 5th century baptistry (for me this was the highlight), the cathedral church and a former bishop's palace - see Frejus for details. Quite unusually the Cistercian abbey at Ginals is now used to display a collection of modern art, both a permanent ciollection and occasional temporary exhibits. The original abbey dates from the 12th century although it was much extended in the 17th and 18th centuries. Despite the revolutionary fervour for destroying monastic buildings you can still see the restored church, cellar and chapter house from the abbey. These three towers together dominate the entrance to the harbour in the center of La Rochelle and were built in the 14th and 15th centuriues as part of the town defences. either side of the actual entrance you can see the Tour Saint-Nicolas and the Tour de la Chaine while the Lantern Tower is close by and is particularly interesting because of the graffiti carved in the walls during the centuries that the tower was used as a navy prison. See La Rochelle towers for our guided tour. The ruins of La Sauve Abbey are sufficient for us to appreciate that is was once an important religious center and also an important example of french romanesque architecture. On the columns of the original church you can still see the carved capital stones depicting both mosters and characters from the Bible. it is also possible to ascend the belltower to have views across the surrounding countryside. La Turbie is a Povencal village dominated by the Trophy of the Alps. Although only a part of the original monumental structure remains - in particular the statue of Augustus that once stood here is no longer present - it is more than sufficient to remind us of how imposing the Roman Empire once was. The Trophy des Alps was built around 6 BC to commemorate the Roman vicories under Emperor Augustus against the tribes of Gauls in the region. There is also a scale model of the original here, carefully maintained gardens, and some of the best views along the Cote d'Azur. Gramont castle (in the gascony countryside at Lavit in Tarn-et-Garonne) still retains a small part of the original medieval castle as the Simon de Montfort Tower but most of what we see today is a 14th century and 16th century rebuilding. The 16th century part of Gramont Castle is in the Italian renaissance style as seen in the many sculptures in the facades (in particular around the doorway). 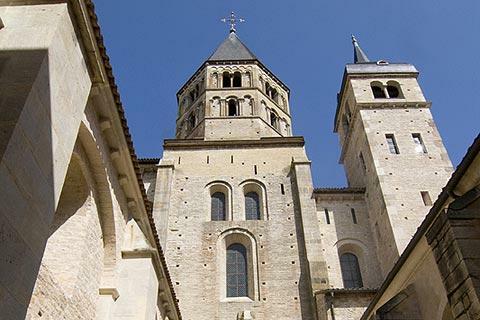 One of the more complete benedictine abbeys in France, Bec-Helloin was an active monastic center in the middle ages and has also been since 1948 (after the revolution monastic establishments were abolished in France). There are several highlights during your visit including the arcaded cloisters, the saint-Nicholas belltower (15th century), the abbey church and some of the monastic living spaces. There is a great deal to discover in Le Puy-en-Velay with the Cathedral being the highlight. Le Puy-en-Velay was the start point for one of the most important pilgrim routes and the cathedral was built in the 11th-12th centuries to cater for their religious needs. You can also visit the newly restored cloisters at the cathedral. See more at Le Puy-en-Velay. Thoronet Abbey in Provence is a 12th century Cistercian abbey that is set in a quiet area of woodland. Less imposing than many of the well known abbeys in France Thoronet is appealing because of its simplicity and setting, and one of the best to visit to learn about typical Cistercian architecture in the early middle ages. Although the morbihan is better known for the Carnac standing stones (also a National Monument) allow time to visit the megaliths of Locmariaquer as well. The site has three important neolithic monuments dating back about 6500 years: the Grand Menhir Brisé (trans: broken, so called because it is broken! ), the Dolmen de la Table des Marchands (trans: the Merchants Table) and the Tumulus d'Er Grah. You can also see ancient hieroglyphics inside the burial chamber. The treasury in Saint John Cathedral in Lyon features a wide selection of religious items dating back as far as the Byzantine (post Roman) era, and as recent as the 19th century, with numerous interesting items including tapestries, porcelain and gold and silver items. See Lyon for other highlights in the city. It is said that this 17th century castle overlooking the Seine River provided the inspiration for the Palace de Versailles and other castles. The Chateau de Maisons is generally considered to be one of the best proportioned French castles, due to the talents of the architect François Mansart, who designed it to be the King's hunting lodge. Built in 1524 the Chateau d'If stands on an island just off the coast at Marseille. Built as a fort the castle became a prison - and then gained fame as the prison where the 'man in the Iron mask' was imprisoned in The Count of Monte Cristo by Alexander Dumas. See Marseille for this and other highlights in the city. In the mountains of the Hautes-Alpes department in a site that is naturally defensible at the head of the Durance valley and the Guil Valley, Mont Dauphin Fort was originally based on the designs by legendary militay engineer Vauban then substantially reinforced until the 19th century. It is an unusual design that incorporates the classical architectural style into 19th century fortifications. One of the most easily recognisable landmarks in France, the island and benedictine abbey at Mont Saint Michel are an astonishing achievement of both military and religious architecture from the medieval period, and were a very important pilgrimage destination for more than 1000 years. As well as the abbey church itself you can see the associated buildings such as the refectory, cloisters and gardens. In summer a visit is extra special with 'sound and light' displays making the most of the setting each evening. See Mont-Saint-Michel guide for visitor information. At Montcaret in the Dordogne you can see the substantial and high quality mosaics that have been excavated on the site of a Gallo-Roman villa. Covering the period from the 1st to the 5th centuries you can see the layout of the villa with its courtyard and baths. See Montcaret guide for visitor information. At Montmaurin you can see the substantial remains of what was once a luxurious roman villa with several parts clearly distinguishable including the temple, living areas, courtyards and the so-calles Nymph's Grotto. It is thought that the villa dates from the 1st century and was substantially altered around the 4th century to give the layout we see today. One of the more unusual of the National Monuments, Enserune was the location of an important citadel from around 600 BC until around 50 AD. The citadel is no longer but numerous artefacts have been excavated here and are accumulated as collections that are on display in the museum - a remarkable reminder that the quiet countryside we see today was for so long an important center of activity. The castle at Motte-Tilly is unusual in being built from a mix of brick and sandstone during the 18th century and is a fascinating castle for its classical style architecture. Inside you can see many impressive examples of 18th century furniture while the extensive gardens and parkland around the castle include sections in both English and french style, and less formal park areas. While most of the listed National Monuments qualify on the basis of their architectural merit and importance there are certain exceptions - most notably when a property is listed and preserved because of its famous owner. such is the case with the George Sand House. Built at the end of the 18th century, the house of George Sand was her home and inspiration for many of her most famous books. One of the most interesting castles in Poitou-Charentes, Oiron Chateau is perhaps best considered as a 'Loire Chateau away from home'. Dating from the 16th century it is inside the castle that there are most surprises with the beautiful decoration, the paintings and works of art, and also an exhibition of more contemporary artworks and objects. See our Paris travel guide for details of these and other highlights of a visit to Paris. Viollet-le-Duc had something of a reputation for trying to recreate an overstylised history with his 19th century renovations (for example at Carcassonne) and it was he who renovated the 15th century castle at Pierrefonds to be both a typical castle of the middle ages and also a magnificent home for Napoleon III. The features of the castle might not always be strictly historically accurate but it is nonetheless a fascinating historical monument to explore. On a peninsula towards the north of Finistere (Brittany) the Cairn de Barnenez is avery imposing neolithic monument, about 6000 years old and comprising two separate but adjacent cairns. The extensive works include galleries and several burial chambers and is a rare insight into what life might have ben like at that time when hunter-gatherers were just learning how to create settlements and live in communities. See Plouezoch for local information. Most unusual among the French national Monuments, Villa Savoye was only built in the 20th century. It has been listed because of its importance on modern architecture aroud the world. We all know of the famous cave paintings in the Vézère valley (Dordogne) but further west in the Gironde you can discover another extraordinary cave system with numerous prehistoric art paintings. The paintings in the caves, mostly of animals, date back up to 33,000 years while other items found here from the same period can be seen in a museum area. 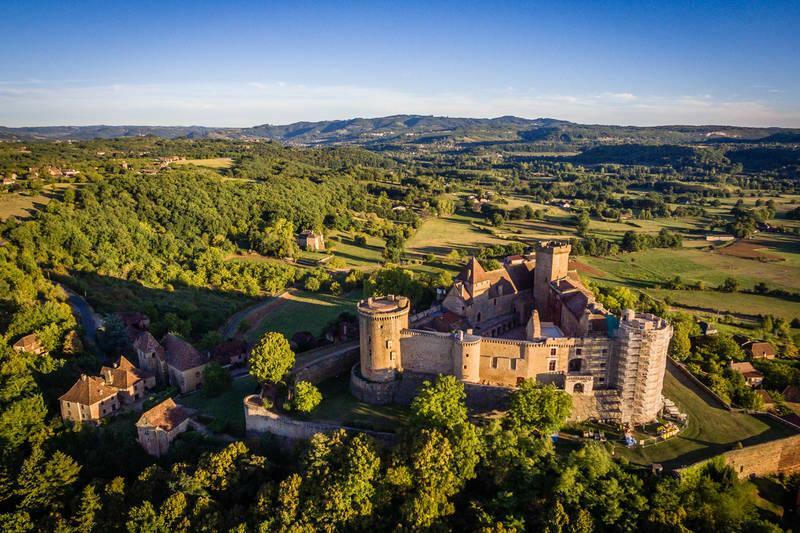 Originally a fortified castle, as seen in its defensive walls and towers, castelnau-Bretenoux castle is perhaps better known now for its association with Jean Mouliérat, the 19th century opera singer. Mouliérat bought, renovated and altered the castle and left as his legacy a substantial collection of artworks, furniture and tapestries that can now be seen in the castle. In France the castle at Rambouillet is best known because it is the official residence of the President and sometimes appears on the news when foreign statesmen visit France. The castle is also a National Monument and open to the public. Rambouillet was originally a defensive medieval castle but it has been greatly transformed since the 14th century, culminating in its use as an occasional home by King Louis XIV. As a result you can see several very opulently furnished and decorated rooms in a variety of styles. Don't forget to visit the Dairy (also listed as part of the National Monument) before exploring the extensive formal gardens. The town of Reims has two listed national Monuments - the Palace of Tau and the towers of the imposing gothic style cathedral. Both have played important roles in the history of France - especially with royal coronations: kings would stay in the palace before and after their coronation in the cathedral. See Reims for more details of these two monuments. Close to Paris the National Park of Saint Cloud was, until 1870, an extensive park around a chateau. The chateau burned down but the park was maintained. The garden and park areas were designed by the renowned landscape gardener Le Notre and cover a very substantial 460 hectares including formal gardens, park areas and woodland. Set in the Lot Valley, one of our favourite regions of France, the 16th century Chateau Montal has more in common with the castles of the Loire Valley than those in this region and incorporates medieval design elements with renaissance architecture. An extensive renovation programme over the last 100 years has made Montal castle one of the highlights of a visit to the region. Now a quiet location near Saint-Remy-de-Provence it is hard to imagine that for almost 1000 years Glanum was an important settlement. Starting around the 6th century BC the site was inhabited by the Gauls, Greeks and Romans. The area has now been excavated and explored and remains and traces of many historically important edifices discovered. Certainly this is one of the least imposing of the National Monuments in France, but is fascinating because of its association with Georges Clemenceau, French statesman and Prime Minister for the final year of World War One. This house was his summer residence and where he created an impressionist style garden among the sand dunes after a challenge by his friend, the artist Monet. Near the Languedoc coast, the Fort at Salses dates from the end of the 15th century. At that stage the region was part of Spain, and it was built by the Spanish s part of their northern defences against France. Inside the defenses of the fort you can see one of the best examples of military architecture of the period with an extensive range of buildings - Note that the whole building is inset in the ground to reduce the amount of fortifications visible (and therefore subject to attack). In the pre-Christian era (the first few centuries after Christ) Sanxay was a popular pilgrimage center for followers of two of the Roman gods, a site that was believed to possess special healing properties. Today we can see substantial remains of this Roman settlement set over a large area, including the remains of the baths, the amphitheatre and several temples. Saorge itself is a very picturesque village on the slopes of a hill in the Roya Valley north of Nice. The monastery stands at the edge of the village surrounded by olive groves with views across the village. The Franciscan settlement is based around a baroqque style chuch built in the 17th century and includes other highlights such as the refectory and the cloisters with their frescoes painted in the 18th century. See Saorge guide for details. The Auvergne and Massif central region to the south of France has a very distinctive and unique style of architecture, with Castle Aulteribe a good example. It's exterior also gives little clue to the remarkable furnishings it contains with Aubusson tapestries, important paintings and some very high quality pieces of furniture from the 17th-18th centuries, a collection which attracts enthusiasts from far afield. Léon Gambetta was a leading French politician at the time of the Franco-Prussian War (1870) and the founding of the Third Republic (1875). Gambetta's House, near Paris, had once belonged to the author Honoré de Balzac the passed to Gambetta who spent his retirement years here. The 'Maison des Jardies' as it is known has been maintained in its 19th century appearance and contains exhibits from the life of the politician. A little way north-west of the major castles of the Loire Valley, Talcy is less famous than its neighbours and also provides an interesting contrast to them. Although Talcy is a renaissance style castle it avoids the Italian style decorative embellishment that adorns many of the other renaissance castles in the region. There are also a good number of outbuildings and a substantial colection of 18th century furniture and decorative elements to be seen. One of several French national Monuments dedicated to important French statesmen and politicians this 18th century house on Rue de la Victoire in central Tarbes is now a tribute to Marshall Foch, a very popular politician in France during World War One. See also Tarbes for information and other sights in the town. Based in an attractive building from the renaissance period next to Tours Cathedral the Psalette cloisters was once used as a place for practicing religious chants. The cloisters includes three galleries, a large amount of intricate decorative stonework and a particularly noteworthy open staircase rather similar to a small version of the one seen at the Chateau de Blois. See Tours for information and other sights in the town. Ernest Renan was a highly regarded philosopher and author in the 19th century, and in Treguier you can visit the attractive 17th century colombage house where he was born. Renan worked in a small room upstairs while his mother ran a grocery shop downstairs. A room on the first floor has been recnstructed as a copy of the office where he worked at the College de France. various items belonging to the author can also be seen. Of the many imposing castles in the Dordogne the Chateau Puyguilhem is the only one to be listed as a National Monument. It is also unusual among the Dordogne chateaux in that it is a renaissance style castle (rather than medieval style). There are numerous renaissance features to admire, both outside (such as the window surrounds and staircases) and inside (such as the Great Hall and the main staircase). The castle is lovingly furnished with tapestries and furniture, typically of the 17th-18th centuries. In the heart of the Auvergne and built of the stone that is typical of the region Villeneuve-Lembron castle dates from the 15th century. The castle is above all known for its interior which features a large number of painted scenes depicting the life of Rigaud d’Aureille who built the castle, and also others relating to medieval times and mythology. Unusually the castle also has a good colection of 15th century furniture, and there is an impressive series of Aubusson tapestries. While many visitors explore Avignon across the river the fort at Villeneuve-les-Avignon is less well known, but this important monument should also form part of your visit - it is one of the best examples of 14th century military architecture in southern France. The Vincennes Castle near Paris was a royal residence for a long period, between the 12th and 18th centuries and in particular after King Charles V converted the existing manor house into a grand castle in 1365. Following major renovations in recent years the chapel and towers are open to the public, along with the castle keep - dating from the 14th century and the tallest in Europe. This keep was also used as a prison for almost 400 years, with the marquis de Sade among the most famous prisoners held here. The only listed National Monument related to Napoleon, this site was selected for the column because it is close to the Boulogne camp where Napoleon brought together an army for a planned assault on England. Thanks to National Monuments of France for some of the information on this page. Photos are copyright.